CIO priorities center on three strategic business objectives: reducing costs and increasing efficiency; mitigating risk around security, availability, and performance; and enabling agility, faster services, and aligning IT with the business. 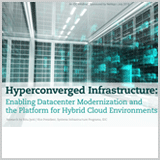 Download the IDC InfoBrief to learn how HCI enables new market opportunities. How the proliferation of data infrastructure silos is hurting your business, and much more.